As I was living vicariously on Facebook again this afternoon, I came across a forwarded page from nutritionist Christine Cronau. 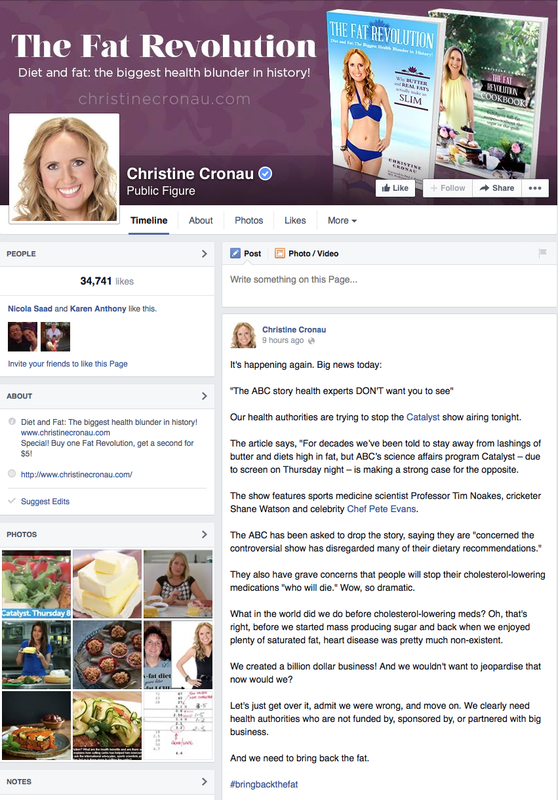 She was previewing tonight’s (Australian) ABC episode of Catalyst, on the topic of the low fat diet. It’s not that she or the ABC are necessarily wrong about low fat diets. Some scientists have been sceptical of the evidence for low fat diets every since they were proposed in the late 1970’s . Often, low fat foods have been manufactured with extra sugar to make them palatable again . So while western consumers have been thinking they’ve been doing the right thing, they’ve probably been making the problem worse. We’re also a society of carnivores, and the meat consumed in modern society is much higher in saturated fat. Plant and seafood based diets contain a high number of poly-unsaturated fatty acids (omega-3 and omega-6) which has also been a recommendation for our heart health, however a study in JAMA in 2012 suggested that high levels of omega-3 PUFAs did not protect from cardiovascular disease or reduce all cause mortality . On the other hand, it appears that reviews of scientific research have suggested that saturated fat doesn’t pose a significant risk for cardiovascular disease or all-cause mortality either . This is a classic case of “two wrongs don’t make a right”. Sure, low fat diets are probably not the all-glorious panacea that they were touted to be, but suggesting that heart disease didn’t exist before the rise of sugar and low fat foods is grossly inaccurate. 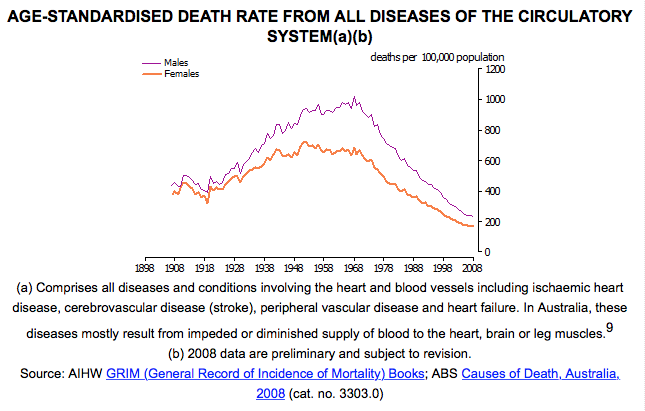 A quick glance at the data of the Australian Bureau of Statistics shows that heart disease peaked in the late 1960’s, which was coincidentally before we started mass producing sugar and back when we enjoyed plenty of saturated fat, and has since dropped significantly. Is that because of dietary guidelines recommending a low fat diet? There are many contributors to heart disease, so low fat diets can’t be singled out as the sole cause, especially in light of the reviews I discussed above. The reduction of smoking may be part of it, as smoking has dropped in the same amount of time, although a significant proportion of our population still smoke. Whatever the reason, it isn’t a good reflection when you try and support your argument against a fallacy with a fallacy of your own. I haven’t read any of her other material, so her books maybe quite cogent. However, Ms Cronau’s Facebook post today provides a good example of how cognitive biases can sometimes blind us to facts that don’t agree with our chosen position, and why we all need to be careful when evaluating the evidence of “experts” on line. This entry was posted in Biological and tagged ABC, all-cause, Australian, bureau, cardiovascular, cardiovascular disease, Catalyst, diet, disease, fallacy, fat, heart disease, low fat, mortality, omega-3, omega-6, polyunsaturated, saturated, saturated fat, smoking, statistics by cedwardpitt. Bookmark the permalink.